In the mood to watch some college football? The Wildcats are here to help. The team finished their 11th practice of the spring season Friday morning, and the folks with the team’s media department were kind enough to put together this highlight tape. Everything looks good on a highlight reel. Kentucky fans will have the chance to check out next season’s team in action one week from today – Friday, April 12 – during UK’s annual Blue/White Game. With the Spring Game just one week away, Mark Stoops called into this morning’s Kentucky Sports Radio to update fans on how the football team’s doing in spring practice. Nick already shared a little bit from the interview with you earlier, but here are five more things. It feels like every year, we hear the wide receivers are better only to be disappointed in the fall. Stoops insists that the passing game is making progress, and won’t just be the Lynn Bowden Show. “I really like what we’re doing offensively. I really feel like we’re working hard to make improvements in the areas that we all know we want to make improvement in, and that’s throwing the football and getting the ball down the field a little bit. I really feel good about that. I feel like Terry’s going to make a big jump. He’s coming back after winning ten games and he’s worked extremely hard fundamentally, throwing it and just his basic fundamentals. Stoops singled out Josh Ali, Isaiah Epps, Ahmad Wagner, and Bryce Oliver as players to watch. On the other side of the ball, Stoops admitted the Cats will take a hit due to the amount of talent headed to the NFL, but he’s very pleased with the interior defense, specifically Quinton Bohanna. How’s recruiting? Stoops said that Kentucky has hosted over 100 prospects on unofficial visits this week, proof that the ten-win season turned heads. Dang. Nick will have more on those visitors for you tomorrow. In less than three weeks, Josh Allen will be part of an NFL franchise. You could hear the pride in Stoops’ voice when he talked about his former pass rusher, who is projected to go in the top five of the draft. With the AAF officially over, Austin MacGinnis is once again looking for a new home. Like us, Stoops can’t understand why an NFL team hasn’t picked up MacGinnis, Kentucky Football’s all-time leading scorer. Listen to the interview yourself below, and if you haven’t yet, head to UKFootballTix.com to get your tickets to next week’s Spring Game. After a ten-win season and a Citrus Bowl victory, Mark Stoops has a ton of talent to replace. As almost a dozen Cats prepare for their NFL future, Stoops is cranking the physicality in spring practice up a notch to provide their replacements with valuable reps.
“It’s hard to replace that. We gotta put them in as many game-like situations as we can,” Kentucky’s head coach said on Friday’s edition of Kentucky Sports Radio. Stoops has never had more than three scrimmages in one session of spring practice. “I just gotta put pressure on our guys and put them in as many game-like situations as we can,” he said. Three position groups need the experience more than others: defensive backs, outside linebackers and wide receivers. Stoops is confident that Terry Wilson’s second year as the starter will help the passing game grow. Josh Ali, Isaiah, Epps, Ahmad Wagner and Bryce Oliver are emerging targets that will complement Lynn Bowden, but at the end of the day, the passing game is not Kentucky’s bread and butter. At one point, former Kentucky pass-rusher Josh Allen was picking up steam for the No. 1 overall pick in the upcoming NFL Draft. He said it multiple times throughout the season, including after Kentucky’s Citrus Bowl victory over Penn State. Since then, though, momentum has shifted toward Oklahoma quarterback Kyler Murray for the Arizona Cardinals with the No. 1 pick. In fact, Odds Shark released their latest odds for Arizona’s first-round choice, and Murray is the overwhelming favorite at -500 overall. As for Allen? He has dropped all the way down to No. 4 in terms of odds for the top pick at +2000 overall. While the odds for Allen going No. 1 overall are dropping, most draft analysts believe Allen will be going No. 2 overall to the San Francisco 49ers or No. 3 overall to the New York Jets. Allen wrapped up his visit to San Francisco yesterday, and he will now take visits to several teams in the upcoming days. Kentucky DE/OLB Josh Allen is wrapping up his two-day private visit today with the SF 49ers, per source. From SF, Allen will go on to Detroit to visit the Lions, and then later visit the Bengals, Buccaneers, Jaguars, Bills, Giants, Jets and Raiders. Busy schedule. We’ll see what happens on April 25. Replacing Josh Allen is no easy task. Hard to believe, right? After glossing over the outside linebackers’ development for most of the spring season, I opened Brad White’s media availability by asking him how his group is coming along. Since the departure of Allen and White’s promotion to defensive coordinator, he has yet to see other outside linebackers step up to fill the void. Clearly, White is frustrated with the performance of his position group. Even though they are inexperienced, he expects more. Boogie Watson is the leading candidate to be ‘the guy’ in the outside linebackers room. Last year Watson had 24 tackles, five for loss and five sacks lining up opposite of Josh Allen at Sam linebacker. After Boogie, there’s not a whole lot of experience. The other Sam, Alex King, was an inside linebacker until this spring. A true freshman, Jared Casey, and Jordan Wright (3 tackles in 9 games played in 2018) are currently competing to fill in Josh Allen’s former Jack linebacker position. They have some time, but if they don’t get with it, they’ll get lost. The annual Blue/White Game is only eight days away. Up until this point, the team has spent most of the time installing new schemes and techniques. Now it’s time to polish the final product. The coaches have thrown a lot against the wall. Now it’s time to see what has stuck. “Let’s tighten the screws. Okay, I’ve understood it from 20,000 feet above, let’s bring it down. When we get into the spring game, we should understand what we have to do and every single technique coach is asking me to do at every single position. That’s what I want to see,” White said. Things started a little slow. By spring’s end the defensive coaches want to see their guys playing fast. The defense has only a little more than a week left to improve. We’ll find out next Friday if the final product is clean enough for White’s standards. Now I can’t get this song out of my head. Thanks, Coach White. Tuesday we learned Drake Jackson and Quinton Bohanna are having epic battles in the trenches, described by Q as the kind of battles that, “wake you up in the morning.” Today the UK nose guard received more praise from his peers. The former UK linebacker now has 11 practices under his belt as the Cats’ inside linebackers coach. Now that Jon Sumrall’s had some time to soak in the experience, he’s loved every minute. “Coach Stoops is awesome. He’s amazing. He’s done an incredible job of creating a culture in this football program. Just having the opportunity to be a part of that is something special for me,” Sumrall said. Praised by Terry Wilson as a disruptive “ball hawk” in the secondary, the JUCO cornerback talked about his transition into the SEC. He’s already noticed a difference in the speed of the game, but he has one extra benefit under his belt: he previously played wide receiver. Knowing the nuances of that position have given him a leg up through 11 practices. While you were busy losing your mind over the Kentucky Wildcats’ run in the NCAA Tournament, the Kentucky football team was putting in work on the gridiron. To help prepare you for next Friday’s spring game, here’s what you missed through the first ten practices. Kentucky’s head coach is building a brand new secondary. While four or five defensive backs prepare to get drafted, Stoops only has two sure things in spring practice, Davonte Robinson and Jordan Griffin. The safeties have some in-game experience. The same cannot be said about his cornerbacks. How will he find the right fit? “I’ll lose a little more hair, get a little more gray,” Stoops said Monday. Right now there’s a rotating cast of characters vying for playing time. Jamari Brown, Cedrick Dort and JUCO transfer Quandre Mosely are just a few names in the mix. The one that’s wowed Terry Wilson the most is Brandin Echols. Unlike Mosely, who played safety in junior college, Echols has JUCO experience playing on an island. I can personally confirm Wilson’s endorsement. While watching one practice, Echols was one of the few that could consistently keep up with Lynn Bowden. Mark Stoops said, “I didn’t recognize him for a second,” when Bowden strolled into his office one afternoon. The difference is striking. As Lynn watches his old teammates sell themselves to NFL administrators, he’s making some changes to secure the bag. Bowden’s also taken steps to become one of Kentucky’s vocal offensive leaders. Maturity has never been one of his strengths, but this year it’s all business. Gran is being modest. Bowden is moving at a different speed than everyone else. His routes are crisp and his cuts are clean. Huncho is going to be a bad man this fall. Terry Touchdown can’t throw every pass to Bowden. Luckily, others are stepping up. Redshirt freshman tight end Keaton Upshaw has received a ton of praise for his ability to make plays in space and use his big body to catch passes over defenders. Josh Ali is the most consistent outside receiver, safely securing a spot as Wilson’s No. 2 target. There are quite a few young wide receivers that have made jaw-dropping plays, yet for each high, there’s an equal low. Between Clevan Thomas, Allen Dailey, Bryce Oliver and B.J. Alexander, at least one will play a significant role in the offense. Who will separate themselves from the pack will be determined in preseason camp. Ahmad Wagner has unfortunately not been able to consistently participate, missing practices on and off with a lingering hamstring problem. Upshaw is dealing with a hammy, Kash Daniel has not been full-go and Bowden and Kavosiey Smoke were sidelined during practice ten. There have been quite a few guys “banged up,” but luckily nothing serious. One player returning from a serious injury, Landon Young, has been excellent. John Schlarman now has a healthy Landon Young at left tackle, but he lost an All-American and a four-year starter on the right side of the line. Luke Fortner, Mason Wolfe and Darian Kinnard all have plenty of talent and game experience, but continuity only comes with time. Josh Allen isn’t rushing passers off the edge, but Stoops believes the middle of his defensive line is the best he’s ever had at Kentucky. It all starts with Quinton Bohanna. Hampered by injuries last season, the nose guard is transforming into one of the most talented interior defensive lineman in the SEC. Alongside Bohanna, T.J. Carter and Calvin Taylor provide consistency. Phil Hoskins and Josh Paschal are explosive athletes. Kordell Looney and Marquan McCall are fighting for playing time too, giving Stoops’ defensive line at least six solid contributors. A year ago Terry Wilson was just trying to learn the offense. This year he’s learning how to make the offense he led to ten wins more explosive. Without Benny Snell in the picture, Kentucky’s offense is changing. A.J. Rose, Chris Rodriguez and Smoke can handle their fair share of carries, but most of the offensive production will fall on Wilson’s shoulders. This spring Terry Touchdown is embracing the challenge to prepare for another successful fall campaign. “Tuesdays with CJ” will continue this year… even without CJ Conrad. 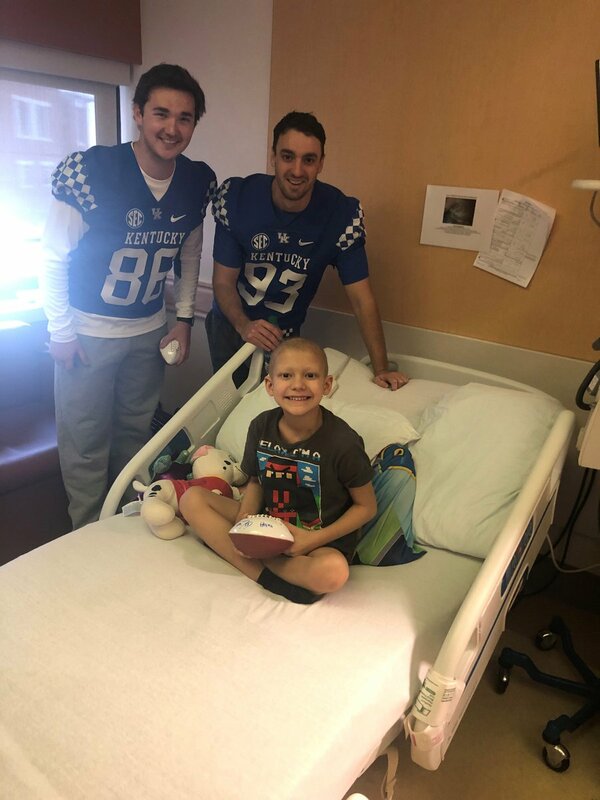 Kentucky’s tight-end became a regular visitor and volunteer at the Kentucky Children’s Hospital last year, meeting with kids and their families every Tuesday. His dedication to KCH led to several friendships with the kids, including nine-year old cancer patient Ryan Cremeens of Richmond, Kentucky. Conrad helped Cremeens ring the bell at his final chemo treatment and invited him to run out of the tunnel alongside the team for last season’s Blue/White game. Conrad’s efforts helped put smiles on some of the most deserving kids’ faces every Tuesday, including Levi and Sam back in September. Now, Conrad is a University of Kentucky graduate. With his own health concerns now out of the way, Conrad is free to compete for a spot on an NFL roster, leaving Lexington behind at least for the time being. Fortunately, his exit from the Bluegrass will not end the heartwarming tradition. The name has changed, but the outcome will hopefully be the same: “Specialists visiting Special Kids” is now up and running. Punter Max Duffy and kicker Grant Mckinniss made their first visit to the hospital yesterday, and they’re both pretty excited. They’ve got big shoes to fill to replace CJ Conrad, who earned numerous philanthropic awards throughout his time with UK, but Specialists visiting Special Kids sounds like an excellent place to start. Today, UK defensive line coach Derrick LeBlanc got his turn on the mic in another exclusive video from the football program. (???) It's defensive line coach @DLTough's turn on the mic! ? LeBlanc is entering his third season at Kentucky and he has already done a phenomenal job with the defensive line. He has really developed UK’s young talent and last year he turned the D-line into a terrific group when expectations weren’t all that high for an inexperienced bunch, not to mention the unexpected loss of Josh Paschal. LeBlanc reportedly received serious interest from some other big name programs this past offseason, but stuck around Lexington for another year. Mark Stoops is lucky to have him on staff and now his group will be called upon to lead as the veterans of the defense next fall. Could two former Kentucky Wildcats lead the New York Jets’ defense? Avery Williamson wants Josh Allen to join him in the Big Apple. “I’d be very excited to have him on the team,” the former UK linebacker said on Wednesday’s edition of Kentucky Roll Call. An All-SEC linebacker in 2013, the former Wildcat has spent most of his spring in Lexington, completing classwork to earn his degree and training at the Joe Craft Football Training Facility. During stints in New York City, he’s lobbied for the Jets to select Kentucky’s National Defensive Player of the Year with the third overall pick. “I’ve been talking to them, so I’m anxious to see what’s going to happen. I’m very anxious. I’m curious to see what’s going to happen. I told him if he comes up here, he’s going to be spending his first $20,000 on me,” Williamson joked. All joking aside, right now all signs point Allen to New York City. ESPN, Bleacher Report, CBS and NFL Network analysts all predict the Jets will pick Allen at No. 3 overall. Many things can change over the next three weeks. Allen is confident he’ll be selected in the top five, but there’s still plenty of uncertainty. That’s why Williamson believes the final month leading into the draft is the most stressful part of the process. It doesn’t get any easier on draft day. “That’s even worse, because you just don’t know when. It’s a waiting game, nervous, anxious and excited all at the same time,” Williamson said. Williamson didn’t just talk about the NFL Draft and his new coaches during the 20-minute interview. He shared what it was like to see the Kentucky’s successful season from afar and how much has changed since Mark Stoops’ first season in Lexington. Williamson also shared why he decided to come back to Lexington to finish school, State Street celebration stories and why partying at UK is better than New York City night life. Go ahead and subscribe to our podcast on iTunes. You won’t regret it. With the basketball season now over, it’s time to turn our attention to the NFL Draft, which is only 23 days away. Josh Allen is still projected to be a top five pick and is making the rounds to visit the teams that might draft him. According to NFL Network’s Tom Pelissero, Allen arrives in San Francisco tonight for his meeting with the 49ers, who have the No. 2 pick. According to NBC Sports’ Jennifer Lee Chan, while in the Bay Area, Allen will also see the Oakland Raiders (fourth pick), and per Pelissero’s report, he’ll visit the Detroit Lions (eighth pick) later this week. In other draft news, I’ve been back in Nashville for approximately 24 hours and all anyone can talk about is how they’re removing — excuse me, relocating — 10 cherry trees to make way for the largest stage in NFL Draft history. Between the hype, the traffic, and the #NewNashville outrage, I’ll be shocked if the city survives. Kentucky spring practice has transformed into trench warfare. In the middle of it all, Drake Jackson fortifies the offensive line. As soon as the fourth-year center snaps the ball, he takes a lick from Quinton Bohanna. Clashes between the two are turning heads at the Joe Craft Football Training Facility. Jackson has become a staple of Kentucky’s offensive line as the starting center over the last two seasons. Even though he’s had plenty of success, nothing comes easily at spring practice. Jackson welcomes the competition from Bohanna. As Bohanna elevates Jackson’s play, the rest of the defensive line is pushing the offensive line. While Schlarman searches for Bunchy Stallings and George Asafo-Adjei’s replacements on the right side of the line, Luke Fortner, Mason Wolfe and Darian Kinnard are challenged by veterans. Even though Kentucky lost its National Defensive Player of the Year on the edge, stars are emerging in the middle of the defense. For the last two seasons, Kentucky’s offense struggled to stretch out opposing defenses with a deep play threat. One of the primary goals go the spring season is develop targets who can make plays downfield. On Friday, UK’s offense did just that. Terry Wilson echoed his offensive coordinator’s sentiment. The key is doing it consistently. While Terry Touchdown grabs headlines, Mark Stoops does not want Gunnar Hoak’s play to go unnoticed. Even though he’s going up against a thin second team defense, Hoak was poised on scoring drives. Like most of the play this spring, inconsistencies can be found just about everywhere. However, errors happen far less when the Cats are running the ball, thanks to the experienced left side of the line that features Landon Young and Logan Stenberg. In the fall, the Kentucky football team practices in the afternoon. That changes to the mornings in the spring, leaving the rest of the day uninterrupted for players to focus on academics. Stoops might change that moving forward. The cold spring mornings often force the team into the Nutter Field House. Cramped quarters with a track that doesn’t give the football team a complete 100-yard field, today two players, Lynn Bowden and Kavosiey Smoke, could not finish practice because injuries on the indoor field turf. They aren’t the only ones on the injury report. Wide receiver Ahmad Wagner safety Tyrell Ajian have missed a few practices with lingering hamstring issues. Tight end Keaton Upshaw has been one of the most praised young playmakers throughout the first ten practices. In the middle of another exceptional scrimmage, Upshaw tweaked a hamstring last Friday. He hopes to return in time for the spring game, but his status remains up in the air as of today. It’s frustrating for the redshirt freshman tight end who was sidelined with a meniscus tear in his first fall on campus. Even though he was limited, Upshaw learned quite a bit from C.J. Conrad. Once Upshaw gets a clean bill of health, he brings quite a bit to the table. When Vince Marrow steps in front of a microphone, it’s always a good time. The latest edition of Mic’d Up is no exception. The two-minute KyWildcatsTV videos focus on how different coaches interact with players during spring practice. In Marrow’s case, that includes quite a few jokes. Of the 2:20, at least 1:30 is spent giving the players all different kinds of hell. After one Luke Fortner rep, we even got the Big Dog’s best Darth Vader impression. If you prefer to focus on the actual football, you’ll see a lot of good things from No. 88. Keaton Upshaw has been one of the most talked about new playmakers this spring. Even in just a few short clips, you can easily understand why.